A right to equality and non-discrimination is widely seen as fundamental in democratic legal systems. But failure to identify the human interest that equality aims to uphold reinforces the argument of those who attack it as morally empty or unsubstantiated and weakens its status as a fundamental human right. This book argues that an understanding of the human interest which equality aims to uphold is feasible within the jurisprudence of the European Court of Human Rights (ECtHR) and the European Court of Justice (ECJ). 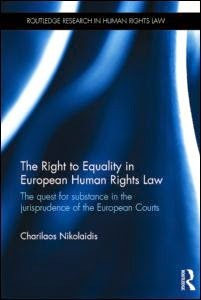 In comparing the evolution of the prohibition of discrimination in the case-law of both Courts, Charilaos Nikolaidis demonstrates that conceptual convergence within the European Convention on Human Rights (ECHR) and the EU on the issue of equality is not as far as it might appear initially. While the two bodies of equality law are extremely divergent as to the requirements they impose, their interpretation by the international judiciary might be properly analysed under a common light to emphasise the substantive dimension of equality in European Human Rights law. * T. Schilling, 'On equal footing: the participation rights envisaged for the European Union after its accession to the European Convention on Human Rights', Human Rights Law Review, vol. 14, no. 2 (2014) pp. 197-229. * C. Bezemek, 'Services exacted instead of compulsory military service: the structure of the "prohibition of forced or compulsory labour" according to article 4(2) of the ECHR', European Human Rights Law Review, no. 3 (2014) pp. 263-271. * L. Peroni, 'The European Court of Human Rights and intragroup religious diversity: a critical review', Chicago-Kent Law Review, vol. 89, no. 2 (2014) pp. 663-688. 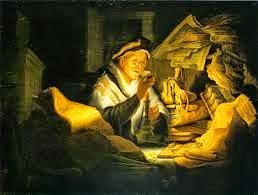 * Koen Lemmens, 'Larvatus prodeo? Why Concealing the Face can be Incompatible with a European Conception of Human Rights', European Law Review, vol.39, no. 1 (2014), pp. 47 - 71. And finally, my older article on the pilot judgment procedure ('The pilot judgment procedure at the European Court of Human Rights: possibilities and challenges' - original can be downloaded on SSRN) has been translated into Ukrainian and has been published in the legal journal Law of Ukraine, no. 3 (2013) pp. 303-317. In recent months, the ECtHR has found several aspects of Hungary’s recent constitutional reform to violate the Convention. The judgments of this spring covered issues such as the removal of the former chief justice from office through constitution-making (Baka v. Hungary), the introduction of life imprisonment without parole (Magyar László v. Hungary) and also the new legal regime on the registration of religious communities (Magyar Keresztény Mennonita Egyház and others v Hungary). These judgments should not have come as a complete surprise to the government, since on a number of key issues the ECtHR reinforced the earlier findings of the Venice Commission. The ECtHR judgments nonetheless provided a handy opportunity for the newly reelected Conservative-Christian government to sound anti-European rhetoric in the heat of the European parliamentary elections. On account of the judgment in the church registration case the secretary of state in the Ministry of Justice was reported by the press to have said that the ECtHR cannot require a member state to change its laws, as only the European Commission can do so. It was in this spirit that the Hungarian government decided to turn to the Grand Chamber against the judgment on the church registration scheme. With the government’s request pending, it is time to reflect on what is novel or unusual in the Chamber judgment that may trigger review by the Grand Chamber. Admittedly, the fact pattern of the Hungarian church re-registration case is highly politicized, though the routine is not entirely unprecedented: most famously, Russia required previously recognized churches to re-register under more stringent conditions in the 1990s. The leading cases of the ECtHR on church re-registration and de-registration originate from a wave of cases arising from this Russian reform attempt. In 2011, in the course of the making of the new Fundamental Law (constitution), Hungary fundamentally altered its church registration regime. As a result of the reform almost all previously registered churches lost their church status and had to seek re-registration (or face the loss of their special legal personality tailored to the needs of religious communities). Re-registration to church status is now granted by a discretionary decision of Parliament, with the exception of the few churches that were recognized by Parliament ex lege. The latest amendment to the 2011 church law was adopted in August 2013, in response to a decision of the Constitutional Court (6/2013 (III. 1.) AB) finding key provisions of the 2011 unconstitutional and also to account for the objections of the Venice Commission on the Fourth Amendment of the new Fundamental Law, which inter alia, criticized the constitutional foundations of Hungary’s newly minted church registration regime. The transformation of the 2011 church law is described in the ECtHR’s judgment on almost 30 pages. According to the latest version previously legally registered churches may receive entry-level recognition as special religious associations from the Budapest High Court upon the request for 10 members, while the privileged status of ‘incorporated church’ is granted by Parliament in a discretionary decision. Conditions for the privileged status include proof of 100 years of international operations, or 20 years of domestic presence and a membership of 0.1 per cent (roughly 10,000 souls) of the population. In accordance with the amended provisions of the Fundamental Law Parliament may grant ‘incorporated church’ status to those religious groups (i.e. previously registered churches) with which it intends to cooperate in order to further community goals. 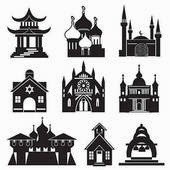 Key differences between ‘incorporated churches’ and religious associations include tax benefits and access to public funds. These differences are critical as under the 1990 law, at least formally, all recognized churches had the same legal status in these respects. Note that these criteria for a two-tier system of church registration replace the conditions of the 1990 church law which permitted 100 believers to seek recognition of their religious community from a court of law, without any further discretionary assessment of fitness. Of the 406 churches which had been registered under the 1990 law only 32 made it into the exclusive club of ‘incorporated churches’ selected by Parliament under the new 2011 church law: of these 14 churches were admitted ex lege, while others were readmitted to church status as a result of parliament’s discretionary decision. In the case the ECtHR defined the issue narrowly, and – instead of assessing the new church registration regime as a whole – it concentrated on the loss of privileges that resulted from the applicant religious communities’ losing their previously registered church status under the new law (see esp. paras. 55 and 95). The reasons why the new Hungarian church registration regime was found to violate the Convention are rather straightforward. A number of basic concerns have already been addressed by the Venice Commission in its two opinions on Hungarian constitutional and legal developments, and are also firmly grounded in the settled case law of the ECtHR. The Chamber reiterated that access of religious communities to legal entity status is a matter of freedom of religion as well as freedom of association (Articles 9 + 11, paras. 44-45), that the state has to remain neutral and impartial in exercising its regulatory power in matters of religions (para. 76), and that when requiring previously registered churches to re-register, the government has to offer compelling reasons (para. 79 and 84). The Court emphasized that the state’s power “to protect its institutions and citizens from associations that might jeopardize them must be used sparingly, as exceptions to the rule of freedom of association are to be construed strictly and only convincing and compelling reasons can justify restrictions on that freedom” (para. 79). The Court’s reasoning is worthy of closer attention, as on account of these familiar basic points the judgment pulls several threads of the jurisprudence together, and elucidates premises behind some key concepts in the case law. In doing so, the Court importantly (1) explained the state’s tasks in granting legal entity status to religious communities in light of the impact of state regulation on individual aspects of religious freedom, (2) explored the deep-seated connection of the requirement of state neutrality and impartiality with the prohibition of discrimination under the Convention, and (3) reiterated the organic connection between access to legal entity status and some other rights and opportunities afforded to churches under national law such as benefits and funding. A careful inquiry into earlier case law suggests that these considerations are hardly novel, indeed, the seeds of these findings have been planted for many years in the jurisprudence of the Court on freedom of religion. According to the separate opinion of Judges Spano and Raimondi, it is irrelevant whether adherents of a religion feel to be second-class citizens as a result of the de-registration of their former church, so long as their community of believers receive legal entity status (separate opinion, para 13). In this respect the position of the dissenters appears to run counter to the longstanding case law of the Court, as the ECtHR has long recognized that “[w]here the organisation of the religious community was at issue, a refusal to recognise it has also been found to constitute interference with the applicants’ right to freedom of religion under Article 9 of the Convention” (Religionsgemeinschaft de Zeugen Jehovas and others v. Austria, para. 62, citing Metropolitan Church of Bessarabia and Others v. Moldova, para 105). Note, furthermore, that the Court’s sensitivity to the negative impact of governmental disapproval of certain religious groups is nothing new or unprecedented in the case law, either. For instance, in Förderkreis v Germany the Court found that while the government’s labeling of the applicants as a ‘youth sect’ and ‘psycho sect’ did not prevent the applicants from operating, it generated a sufficiently negative consequence to be considered an interference (para. 84). Most recently, the Grand Chamber clearly acknowledged in its judgment on the burqa ban (S.A.S. v. France) that the ban had a negative impact on the women concerned (para. 146), adding that “the State which enters into a legislative process of this kind takes the risk of contributing to the consolidation of the stereotypes which affect certain categories of the population and of encouraging the expression of intolerance, when it has a duty, on the contrary, to promote tolerance” (para. 149). Thus, the Court’s attention on the broader societal impact of state regulation on attitudes towards religious communities and believers, and the risk state regulation entails, is clearly not novel. Second, when assessing the Hungarian re-registration requirement from the perspective of state neutrality and impartiality, the Court’s emphasis is on the prohibition of arbitrariness, a concept which is linked at its core to the prohibition of discrimination. The ECtHR’s main concern in the Hungarian case is that in the Hungarian regime “the granting of refusal of church recognition may be related to political events or situations. … A situation in which religious communities are reduced to courting political parties for their favorable votes is irreconcilable with the State’s neutrality requisite in this field.” (para. 102) When being deeply concerned about the open political discretion of the Hungarian parliament in the process of distribution church status in particular cases, the Court echoed the already familiar concerns of the Venice Commission. It is important to note at the outset that recent judgment against Hungary does not deal in any manner with whether parliamentary recognition of churches violates the Convention per se: the emphasis in the Hungarian case is on the open political discretion of the body which is taking the decision on registration. The ECtHR had no objection to a member state having a multi-level church registration system or that parliament was in charge of admitting religious communities to the highest status reserved (see para 100). The reason why the Hungarian regime violates the Convention is the deeply political nature of the process - that the body which gets to decide on incorporated church status is the Hungarian Parliament is not decisive in and of itself. On a more abstract level, the Court’s reading of the prohibition of arbitrariness, as a corollary of the requirement of neutrality and impartiality in clear non-discrimination terms, but without reference to Article 14 is certainly an interesting development. It is worth pointing out, however, that in doing so the Court did not depart from familiar elements of the jurisprudence in cases where Article 9 is read in conjunction with Article 14. At best, the reasoning is seen in this respect as a welcome step towards as a deeper reading of Article 9, and it certainly does not constitute a departure from established case law. Third, in the Hungarian case the Court read the de-registration of previously registered churches in close connection with material advantages that were lost as a result of said de-registration. Dissenting justices Spano and Raimondi argue that the majority is misguided in seeing an interference in the case at all, as the “reclassification” of previously registered churches does not prevent the affected religious communities from manifesting their religious freedom (separate opinion, para. 12). Thus, unlike the majority, the separate opinion reads this case as one on the withdrawal of material benefits, taking the de-registration component out of the picture (and calling it reclassification). Since de-registration of previously recognized church status was the very means used by the Hungarian government to withdraw material benefits (or at least the potential thereof) from literally hundreds of churches, it is difficult to see how these two aspects of the claim would not be connected. It is also worth pointing out that grievances related to lack of entity status and material benefits are often intertwined, and that the Court has treated them to be indistinguishable before. The lack of such a distinction was central to the ECtHR’s judgment e.g. in Holy Synod of the Bulgarian Orthodox Church (Metropolitan Inokentiy) v. Bulgaria where the Court found the lack of legal recognition of the Bulgarian Orthodox Church’s breakaway faction not distinguishable from the property dispute before the ECtHR (para. 174). In Religionsgemeinschaft de Zeugen Jehovas and others v. Austria, in a case concerning acceptance to a higher level entity status, the Court noted that “under Austrian law, religious societies enjoy privileged treatment in many areas. These areas include exemption from military service and civilian service, reduced tax liability or exemption from specific taxes, facilitation of the founding of schools, and membership of various boards. Given the number of these privileges and their nature, in particular in the field of taxation, the advantage obtained by religious societies is substantial and this special treatment undoubtedly facilitates a religious society’s pursuance of its religious aims.” (para 92). Most recently in The Church of Jesus Christ of Latter-Day Saints v. the United Kingdom, a tax exemption case, the financial claim and the violation of applicant’s manifestation of freedom of religion (Article 9 and 14) were said by the Court to be indistinguishable (para. 38). The jurisprudence has solidified in recent years on requiring members states to provide rights to funding and other advantages to religious communities in a non-discriminatory fashion (for references, see para 107). The requirement of non-discrimination is not affected by the fact that there is no right to state funding for religious organizations under Article 9 (Ásatrúarfélagið v. Iceland (dec.)). However, according to the standing case law of the ECtHR: once a member state “has gone beyond its obligations under Article 9 of the Convention in creating such rights cannot, in the application of those rights, take discriminatory measures” (Savez crkava “Riječ života” v. Croatia, para. 58). The one novelty which the Court added to its longstanding jurisprudence in this respect is the conclusion that since benefits cannot be granted in a discriminatory fashion, they cannot be withdrawn in a discriminatory manner either (para. 107). It appears especially significant for the Court that the funding re-distributed by the Hungarian state concerned the outsourcing of public interest tasks and thus was not funding for faith-based operations (see para. 109). The separate opinion takes issue with this conclusion, arguing that with taking the prohibition of discrimination to apply not only to the distribution of funds, but also to the “withdrawal of previously afforded material benefits” the majority has expanded Article 9 to previously unseen areas (separate opinion, para. 14). The dissent’s ultimate objection is not that withdrawal of funds was treated similarly to the awarding of funds. Rather, the dissenters object because the majority has reached this conclusion on the basis of Articles 9+ 11, and without taking into account Article 14. 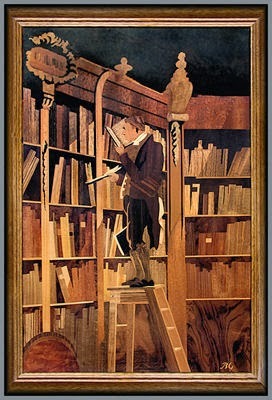 It is worth recalling, however, that although applicants submitted a separate complaint under Articles 9+11 in conjunction with Article 14, due to the indivisibility of the claims on the impact of the applicant’s de-registration as a previously recognized church, the Court decided to treat their complaint under Articles 9+11, reading a thick non-discrimination requirement into the principles of neutrality and impartiality. In light of the above overview, it appears that although the Court added texture to its long-existing jurisprudence on the standards applicable to the de-registration and re-registration of previously registered churches, it did not depart from its long-standing case law. The novelties of the Chamber judgment are best seen as resulting from an exercise in which already familiar dots are connected in new ways due to the peculiarities of the facts of the case. This comprehensive treatment of the applicants’ claims is a much welcome development as it offers insights into the deeper considerations informing the judgment of the Court, but they certainly does not bring unexpected twists to settled jurisprudence that would warrant consideration by the Grand Chamber. Thus, while the discontent of the Hungarian government is understandable as the Court has ruled against Hungary in several cases lately, the judgment in the Hungarian church re-registration case is hardly an unforeseeable surprise upsetting the settled jurisprudence of the Court.